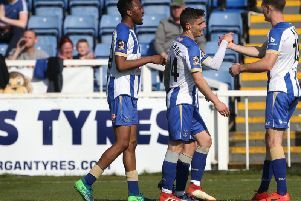 RONNIE Moore admits it can be a struggle to attract new signings to the North-East as he looks to add “quality” to his Hartlepool United squad. The Pools boss is looking to bring in up to nine new players over the summer but Moore says the club’s geographical location can play a key role when it comes to making signings. But as supporters wait for the annual end of season retained list to be announced, Moore insists the focus is on avoiding another season of struggle. SportMail understands talks remain ongoing with several of the current squad who are either at the end of their contract or who have an option for another year, while Moore scans the lists of released players from clubs up and down the country. Experienced Moore has already pledged to make sweeping changes as he clears the decks, with out of contract Marlon Harewood, Matthew Bates and Stuart Parnaby among the senior players facing the axe. The 62-year-old boss is making no promises in terms of where the club will finish next season but he is desperate to avoid another relegation scrap. “We need five or six quality players in and that’s the hard part,” said Moore. “With the location of the club it’s very difficult to get players up here. Moore and assistant manager Sam Collins have been speaking with agents of potential signings for several weeks but the management team didn’t know what decision the club would be playing in until the final week of the season. He admitted the club was in “limbo” until the 2-1 win over Exeter City, a victory that secured another season in Sky Bet League Two. Winger Jack Compton immediately announced he was leaving after two years to be “close to his family”, with Moore telling SportMail Compton had “immense ability” but it was best he left following a frustrating and inconsistent two-year spell. And with more experienced players to follow, Moore admits he is looking to improve every department. He added: “We need players in every position. “For this to happen we’re going to have to move a lot of experienced players out – we can’t afford to keep them. “We’re going to go for a squad that’s a bit younger, a bit more athletic. “We don’t want another season like this again.